Happy Monday peeps! I hope you all had a fantastic weekend and the week is off to a great start. It certainly is going to be cooler this week, I might actually have to put some socks on lol. So today on the blog we are going to talk about something a little different and that is the unique services offered by new powerhouse brand Dia & Co. This styling service has been around for over 3 years now and it has quickly grown into a top brand within the plus size community. I am going to say upfront that unfortunately right now their services are only available in the US. But don’t worry, they know there are a ton of us outside the US who are loving what they are doing and they are working on it. If you have a US mailing address like I do then you would be able to sign up for their services. I had the opportunity to meet and spend some time with the team first when I was in Atlanta for the TCF Style Expo and then when I was in NYC for The Curvy Con and NYFW. I also got a chance to tour their head office and see the magic in action. And as the title sponsor for The Curvy Con this year they definitely brought things to a whole other level. 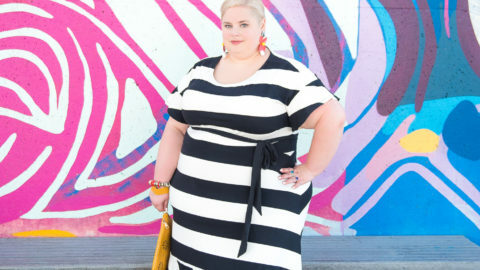 This past winter during fashion week they also launched the campaign “Move Fashion Forward” where they challenged the world’s top designers to dress the 100 million American women who wear plus size clothing. This is a company that is not afraid to tackle the issues that the plus size consumer faces head on and they will not settle to be just the status quo. The tenacity and drive that their co-founder and CEO Nadia Boujarwah shows and has instilled in her team is so inspiring. And the fact that she is plus size herself is just what the industry needs because she gets it, she knows what it is like to be able to not find the clothes you want in your wardrobe in your size. The other thing that has really impressed me is their push to have as many brands as possible available in sizes 14 to 32. When they first started out they quickly realized that there were limited options that went above a size 24 which made it difficult to service ALL of their customers. So they went ahead and made bold moves like creating their own in house brands that offer up to a size 32. That’s right, they didn’t make excuses, they made it happen. They also pushed back to some of their partners and told them they needed to increase their size range. I couldn’t believe it when I heard that you can get Slink jeans for example up to a size 28 through Dia & Co. I respect and admire their ability to make change happen and in a very short period of time. I hear from so many of you that you would love help finding great pieces for your wardrobe and that you aren’t 100% comfortable in pulling outfits together so that is why I think Dia & Co is such a great option for so many women. I mean I would love to be able to personally style all of you if I had the time but I know you are in good hands with the Dia team. So how does the service work? It’s actually pretty simple. Click on the link here, Dia & Co and then click on the Get Started button. You will start off by completing a style profile where you tell them about yourself – sizes, what types of clothing you like to wear, your shape, colours you like and don’t like, what your budget is, particular pieces you may currently be looking for etc. From this information your personal stylist will choose 5 items to send you in your box right to your door so that you can try them on in the comfort of your home. If you don’t like any of the pieces or they don’t fit you can return/exchange them for free, shipping is always on them. Then you will be asked to fill out a survey about the pieces which gives you the opportunity to tell your stylist what you did and didn’t like about the pieces and if there were any issues with fit etc. This helps your stylist get to know you and will make your next box that much better! The styling fee is $20 and it is credited against any item you keep from your box. You might be wondering how much a box can cost you. That will vary depending on what you tell your stylist your budget is. They will always respect your budget and only send you options that you can afford. They do offer a wide variety of brands and price points so things can vary from $35 to $70 for tops, $40 to $110 for skirts and $55 to $125 for dresses. So let`s talk about what I got in my box. I was a little bit nervous because I can`t tell you the last time that I didn`t pick out something for my wardrobe personally. But I like to push myself outside my comfort zone and using a stylist will definitely do that. Being an influencer gave my stylist, Ashby a pretty good platform to get a sense of what my current style is. If you have pictures or your own social media accounts I highly recommend that you share them with your stylist. Pictures make it so much easier to see how garments fit and they give someone a sense of what you already have in your wardrobe. For example, Ashby was able to pick up from my profile that I don`t wear pants that often and she is absolutely right! Opening up my box was just like getting a big present and I love presents and surprises. As I started to pull each piece out I got more and more excited and started thinking about how everything would look. I also loved that the pieces had a cohesive colour palette so that I could mix and match them for even more outfits. The first piece I gravitated to was this boho style maxi dress in one of fall`s hottest colours, merlot. I loved the kimono style sleeves, the v neckline, the empire waist and seaming on the bust. It was a perfect on trend piece for fall. I also really loved that the print was not evenly distributed on the dress but that it was strategically placed to provide more impact to the dress. I chose to pair this dress with all rose gold metallic accessories for a simple chic look. I then added this tone on tone striped bag for some contrast of pattern. I have already worn this to the office and received several compliments. It is comfortable but polished. Next up is this super cute merlot top with a tie waist and cut outs in the sleeves. The funny thing about this top is that it was supposed to come to me in a size 4x but a 2x got sent by accident. But as I kept looking at it I thought that it looked really big and so I tried it on and it fit perfectly. It was probably meant to have a more relaxed shape but I liked the fitted shape. Your stylist sends you a lovely little note explaining why she chose the pieces she did and provides suggestions on how to pair the pieces. Ashby had suggested to pair this top with the jeans but I decided I wanted to pair it with the skirt to play off the richness of the colour palette. But you could easily swap it out for the black top. I love the print on this skirt and the circle shape is perfect for my shape. I added one of my favourite necklaces with this multi layer strand of pearls with a pink flower. Everything else I kept in metallic and added my signature pop of colour with my Coach bag and fur pom pom. Of course you had to guess that there was going to be a pair of pants in my box and in this case, these distressed ripped skinny jeans from RWN by Rawan. Its really quite ironic that Ashby chose these jeans for me because they are definitely outside of my comfort zone with all the rips combined with the skinny leg. Little did she know that I already owned this exact pair because I had just worked with the brand directly when I was in LA and they were one of the pairs I modeled in my look book. So the designer had also pushed me outside my comfort zone. These jeans have definitely grown on me. And then she sent me a black shirt which is something I don’t really own very many of. Surprisingly I really loved this top with its cut out detail, 3/4 length sleeves and the fact that it was form fitting and showed my curves but still had a nice longer length to it. Because it was black I was able to add eye catching accessories like these statement earrings and one of my signature Coach printed bags. It’s a perfect casual look. So what are my thought’s overall on Dia & Co? I absolutely love it and can’t wait to see what is in my next box! Ashby, keep pushing me outside of my comfort zone! Everytime I enjoy your blog. Mostly I react on Instagram. But that gives only a part of your outfits. That’s why I react on your webpage now. It’s a super webpage and I believe many people enjoy this. Hey Lisa! Welp, you’ve convinced me. I’ll be trying Dia & Co soon. You look amazing as usual, boo! It’s a fact that every girl wants look stylish and beautiful, no matter what her weight is. Usually fat girls have not so many option regarding their wearing that’s why mostly they seem simple. But these types of styles are truly a motivation for them. I am looking forward to suggest such clothes to my fat clients. I just received the Adeline maxi in my Dia box and loved it. I’ve seen a few others receive it as well, but I’m seeing quite a price discrepancy! Some people are charged $69 for it and others $49. The names are always exactly the same. What’s going on? I sent a message to Dia, and they responded quickly letting me know that it was a mistake and reimbursed me the $20!